Dr. John Nathan’s offices are located at 815 Commerce Drive, Suite 220, in Oak Brook, 630-574-7336 and 2320 Dean Street, Suite 202, in St. Charles, 630-584-3624, johnenathandds.com. One of the most frequently asked questions in the office of Dr. John Nathan, a local and nationally renowned pediatric dental specialist and diplomate of the American Board of Pediatric Dentistry, is when should children get braces? Over the past few years, this topic has become a controversial subject in dentistry as kids are starting to wear braces earlier and earlier. With different philosophies among practitioners as to when to begin orthodontic treatment, parents can be left with questions and concerns over when their child should begin wearing braces. 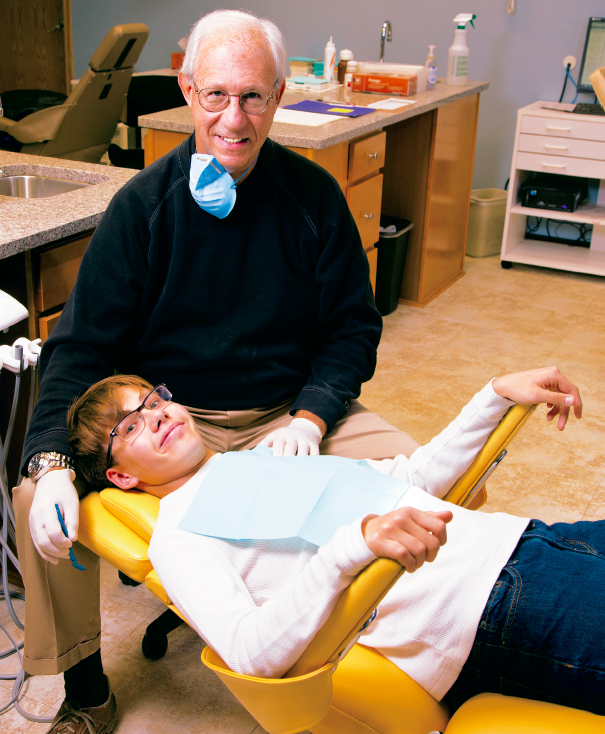 According to Dr. Nathan, the best option for your child will depend on the severity of your child’s dental needs. For the vast majority of children, the most appropriate course is to wait until ages 10-12 or when almost all the baby teeth have fallen out. This approach allows treatment to be completed within a reasonable two to three year timeframe while keeping costs in line. Additionally, children around this age will more readily permit and cooperate for orthodontic treatment as they are more mature and better understand the reasoning behind their visits. So why are more and more children wearing braces as young as 6-and 7-years-old? For some children, more extensive dental work is needed and early treatment may be beneficial in cases with severe malocclusions, or misaligned teeth, where cross bites are present or teeth are protruding outside of the mouth. Initiating limited care early at these ages should be considered only where it significantly reduces the extensiveness and cost of later or second phases of care. Despite the appeal of having braces out of the way sooner rather than later, early treatment is not right for every child. Dr. Nathan believes that early treatment is beneficial for only limited types of malocclusions, in a very small percentage of children. “Some children that start early treatment may end up with a prolonged course of treatment and still have to endure a second lengthy phase of braces which creates a burden on the child, not to mention the additional cost for the parents,” Dr. Nathan states. While most practitioners have the patient’s best interest in mind, it is the parents that make the final decision on which course of action to take. The question to be addressed when determining the appropriateness of early treatment is whether or not it will benefit the child, or is it unnecessarily prolonging treatment? Regardless of which approach is taken, Dr. Nathan encourages parents to ask questions and be fully aware of the advantages and disadvantages of each option in order to make a decision based on what is best for their child’s needs. Seeking second opinions can often prove informative if not enlightening. Dr. Nathan serves as Adjunct Professor of Pediatric Dentistry at the University of Alabama, Birmingham, Case Western Reserve University, and Rainbow Babies Children’s Hospital in Cleveland, and as Associate Clinical Professor, Department of Otolaryngology at Northwestern University’s Feinberg School of Medicine, Chicago, and as attending Housestaff at Lurie Children’s Hospital of Chicago. He is editor-in-chief of the Journal of Pediatrics and Neonatal Nursing, and the Journal of Otolaryngology and Rhinology and serves on the editorial board of five other journals. He is in private practice limited to pediatric dentistry in Oak Brook and St. Charles. This post was sponsored by Dr. John Nathan. His offices are located at 815 Commerce Drive, Suite 220, in Oak Brook, 630-574-7336 and 2320 Dean Street, Suite 202, in St. Charles, 630-584-3624, johnenathandds.com.